The Huntington Theatre has been promoting its 2009-2010 season as being all about uniquely American drama. No where is that more evident than with the current production of Arthur Miller's Tony Award-winning "All My Sons," a 1940's American Dream drama about a family's war and peace. 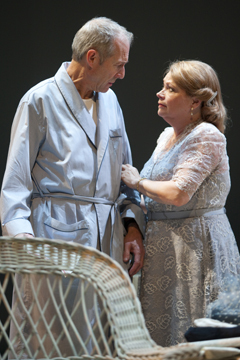 Set in the mid-west, "All My Sons" swirls around a character who never appears but is always present. Young pilot Larry Keller has been lost in the war, supposedly shot down and missing in action. His mother Kate insists he'll return. His fiance, Ann, is now going to marry his brother Chris, who wants his mother to face reality, let Larry go and accept his upcoming marriage. And his father Joe has been accused of having a hand in manufacturing faulty airplane cylinder heads that led to the death of 21 pilots. Could his own son have been one of the victims? The senior Keller was called on his actions, but pointed the finger at his business partner, who, despite pleading innocent, has been sitting in prison for the past three years. The story is further complicated by the fact that Ann, fiance to the missing Larry, is the daughter of Joe's imprisoned business partner -- a fact that will come to haunt them all in different ways. Set entirely in the grassy backyard of the Keller home, the play examines morals and character and why we do what we do. The physical set itself (designed by Scott Bradley) is a combination of realism vs. theatrical. The house is clearly realistic, but the backdrop is completely empty, perhaps reflecting the family's void but also allowing for select projections. As well, the lighting in the fly area above the stage is clearly visible. The effect is both glaring and appropriate. The evening begins with a series of interesting visual effects that establish the time frame via a clip of The Andrews Sisters singing "Don't Sit Under The Apple Tree." This morphs to capture a nightmare, a summer thunderstorm and the destruction of a symbolic memory. All of Miller's characters work feverishly to maintain a facade for their own survival. As Joe, Will Lyman (at left) initially comes across as the grandfatherly guy next door, joshing with kids and leisurely serving as patriarch of the neighborhood. But beneath the jovial demeanor, Joe is working hard to maintain a breezy air. He will come to pay the price for his faults, and Lyman is exacting when Joe's armor cracks. As Kate, Karen MacDonald (at left with Lyman) is fascinating as the woman-on-the-edge who's desperate to keep her son alive, if only through her own furious will. While Kate sometimes comes across as dithered and fragile in her refusal to even discuss her son's fate, in the play's final act she proves to be a tigress, stronger and more lethal than anyone ever imagined. Lee Aaron Rosen builds Chris as charismatic and jovial, only to come crashing to earth when faced with the reality of how he fits into the lopsided portrait of his family's honor. 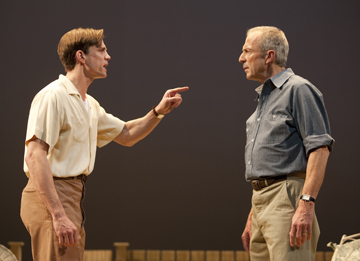 While attention must be paid in "Death of A Salesman," crimes cannot be ignored in "All My Sons." And as Ann, Diane Davis holds the ultimate link to the family's jarring reality. David Esbjornson, who directed the premieres of Miller’s last two plays -- "The Ride Down Mt. Morgan" and "Resurrection Blues" -- directs here. The first act is measured, unfolding in slice-of-life simplicity. However Miller is slowly and methodically dispensing information to the audience. Seeds are cleverly being sown for the confrontations and explosions that come after the intermission. One of America's most prolific storytellers, Arthur Miller remains as compelling today as he was a half decade ago because his work identifies the very human emotions and traits that we all share -- whether we choose to admit it or not. 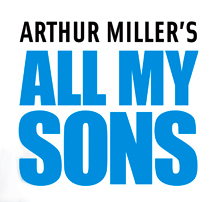 "All My Sons" is at the Huntington Theatre through February 7. For information, call 617-266-0800.